I had the honour of my first Vernissage the other night…… It was a very special occasion! 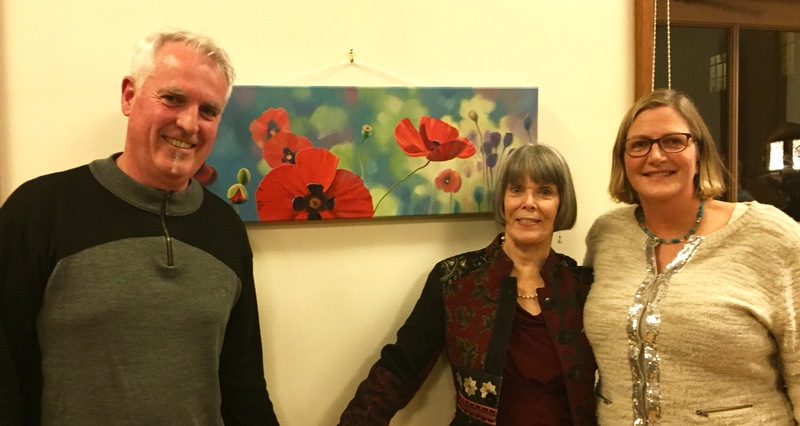 Kristine had never commissioned a painting before and I was invited to speak of my newest painting ‘Wednesday Conversations II” as it was unveiled by its proud new owner to a small gathering of my dear friends from the International Retreat Group (Diamond Approach). It’s always something of a relief when a commission is delivered and warmly met! It has been very touching to revisit this series of paintings that was begun around the time of my father’s death twelve years ago. After reading the book “Tuesday’s with Morrie” I was inspired to spend a day a week with my father as he traversed the last 18 months of his life. This was a time of great healing for both of us and has meant a lot to me over the years. It has meant that I have been able to love him still as I look into the mirror each day and see his face. Each conversation was like a new poppy opening and the tending of old wounds. The stories told and memories that we shared were like the poppies that sprang randomly from the garden and delighted us with their fresh colour and delicacy. A beautiful painting and so lovely that it reminds you of the time spent with your father. Lovely to see your face, Ian 🙂 Have a beautiful end of the year. First of all, congrats Ian 🙂 Second, beautiful painting. Last but not least, beautiful words about your father. Thank you Mopana🙏🏽. It has been a very moving and heart opening experience. Sorry if you get this twice! I tried writing once and the message looked like it did not transmit. Just to say I am sure Kristine will love living with such a beautiful and meaningful work and your words touched me having lost my Dad seven years ago. Also, hope you have a nice Christmas! It turned up twice but nevermind – I enjoyed it just as much the second time! Thank you for your kindness… And I hope the memories of your Dad are nourishing you. Beautiful painting and words Ian … my father passed away seven years ago so your words gave me a real lump in my throat. I am sure Kristine will love living with such a meaningful work. Merry Christmas too!